FILE - Protesters hold candles during a mass prayer for political dissident Le Quoc Quan at Thai Ha church in Hanoi June 30, 2013. Vietnam is coming under pressure from lawmakers in Europe to improve its human rights record before ratification of an EU free trade deal that the Communist government prizes after the loss of a major U.S.-led agreement. European Parliament members voiced concerns in late February about Vietnam as its Subcommittee on Human Rights traveled to the Southeast Asian country. The committee recommended more debate in Vietnam on political rights and freedom of expression and religion. Without meeting Europe's strict conditions on human rights, ratification of the trade agreement will be difficult, the subcommittee's chair was quoted saying in Hanoi. The Vietnamese government has not directly responded to the comments. The deal, signed in December 2015 and due to take effect next year, must pass the European Parliament as well as the legislatures of the member countries. When lawmakers in Belgium deliberated the agreement in January, a number raised questions about Vietnam's socio-economic situation. "They have this very daunting prospect of having to go through 27 national assemblies to get anything ratified," said Frederick Burke, partner with the multinational law firm Baker & McKenzie in Ho Chi Minh City. "That's a challenge to get through all those ratifications." The European Union had pursued the trade deal with Vietnam so its companies could better access an increasingly wealthy consumer market of about 93 million people. The agreement also builds toward an eventual EU free trade agreement with the 10-member Association of Southeast Asian Nations, to which Vietnam belongs. Vietnam wants the agreement as a burgeoning export-driven nation keen to diversify markets and avoid dependence on China, a long-time political rival. Vietnam was a member of the Trans Pacific Partnership or TPP, which would have dropped import tariffs in Japan and the United States. The deal effectively died after U.S. President Donald Trump withdrew the United States in January. EU-Vietnam trade comes to about $40.1 billion per year. 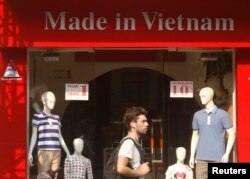 Vietnam counts the European Union, with a market of about 500 million people, as its No. 3 trading partner after China and the United States. "If it's ratified soon, it's much better. The sooner the better for Vietnam," said Hoang Viet Phuong, head of institutional research and investment advisor at SSI Securities Services in Hanoi. FILE - A tourist walks past a clothes shop in Hano,i October 3, 2014. "It should not be a problem because already (it has) been signed," she said. "I think people expected the TPP the most but as the TPP was not realized, this FTA will also help. For sectors such as garments and textiles, we export to Europe a lot." The deal would drop almost all import tariffs within seven years and open Vietnam to European services such as healthcare, packaging and holding exhibitions. Almost a year before the parliament committee's visit to Vietnam, the French advocacy group Worldwide Movement for Human Rights had accused the European Union of failing to do a human rights impact study. The FTA includes "strong commitments to protect people's basic rights at work, their human rights more broadly, and the environment," chief European negotiator Mauro Petriccione said in a statement last year. But the European agreement's language is less rigorous than corresponding text in the TPP, Burke said. The TPP would have required pro-union changes in Vietnamese labor law to stop worker exploitation and forced heavy industries to pay penalties if poor pollution controls caused an impact on trade, with violators facing extra tariffs. "The EU FTA was not drafted as clearly as the TPP," he said. "The language is not as self-enforcing. It relies more on goodwill and people willing to do things." Vietnamese authorities harass and imprison bloggers and political activists as well, American advocacy group Human Rights Watch says. Workers cannot form their own unions, it says, while farmers are losing land to development projects. Some of the estimated 8 million Christians in the officially atheist state are sometimes arrested for airing their beliefs because the government sees their religion as "being tied to foreign powers," the American advocacy group Open Doors says. To satisfy European legislators, the country will probably pass laws or release a few prisoners of conscience without making fundamental changes, said Carl Thayer, Vietnam scholar and emeritus professor of politics at The University of New South Wales in Australia. Hanoi changed what it was required before being allowed into the TPP, he noted. Human rights activists could still criticize Vietnam, he said, but American officials were satisfied. "The real answer is that Vietnam will resist, but instead of stonewalling, like they did with the U.S., they worked out a kind of modus vivendi," he said.